Ground instruction for aerobatics includes stability and control, airplane stresses and flight testing. Flights include stalls, chandelles, wingovers, aileron rolls, loops, loop plus rolls, cloverleafs, Cuban eights, Immelmanns and spins. One flight covers loops, rolls, spin recovery and wake turbulence upset recovery based on flight instruments. 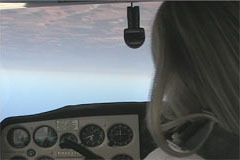 The course may serve as a spin sign-off for the aspiring flight instructor as required by 14 CFR 61.183. With approximately five hours of ground instruction and five flights, this is normally a two-day course for one or a two/three-day course for two. The Aerobat provides the perfect training platform for emergency maneuver training — side-by-side seating, yokes, low power — making the aircraft similar in handling and recovery characteristics to most general aviation airplanes. The aerobatics course is $1600.